Wall-mounted cabinets often have unused dead space above – paint this wall the same color as the cabinets to create the illusion of height. If your kitchen feels dark even on the brightest days, cramped even when it is clean and tidy, you may need a few creative interior design ideas to pull this important family room out of a rut! Small kitchens are difficult to work with, but a few simple and inexpensive changes can make a world of difference. Generally considered the “immovable obstacles”, large appliances and permanent workspaces are the major factors that determine which interior design ideas will work and which ones will flop. Use these features as a starting point for your new decor scheme. Wall-mounted cabinets often have unused dead space above – paint this wall the same color as the cabinets to create the illusion of height. Opting for tall, thin cabinets will have the optimal space-enlarging effect; unreachable shelves are still useful and provide the perfect opportunity to store decorative objects. Alternatively, open cabinet faces can be a great idea for the homeowner that invests in stylish dishes. You see this in many modern home designs nowadays. Effective lighting is critical to maintaining the open atmosphere necessary for a fresh small kitchen. Fully utilize available windows by keeping large, bulky appliances away. Complete the look by framing with long, simple curtains as opposed to squat or frilly selections. Choose recessed lighting for shorter ceilings to save a dramatic amount of space while opening up the upper plane of vision. To give the ceiling a further boost, paint it a few shades lighter than the walls. 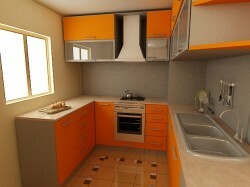 A kitchen of any size has the potential to be versatile, functional, and best of all, beautiful. What your kitchen lacks in space it can make up for with plenty of simple, modern charm. With the right interior design ideas, you can make the most out of even the smallest of spaces – and this philosophy definitely isn’t limited to just the kitchen!